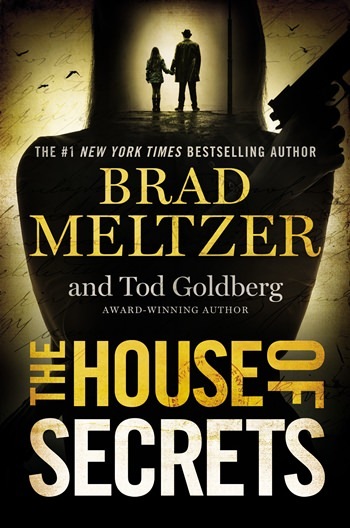 Brad Meltzer, one of the best historical thriller writers in the business, teams up with acclaimed author Tod Goldberg for “The House of Secrets,” and the result is somewhat mixed. Jack Nash is host of a popular conspiracy TV show that has made him recognizable everywhere. His son, Skip, becomes a fixture on the show. Nash’s daughter, Hazel, has been able to stay out of the spotlight, but she has developed the same passion for historical conspiracies and tales, thanks to her father’s stories. One tale she fondly remembers involves a leather Bible belonging to Benedict Arnold found inside the chest of a frozen corpse. The question of who would do such a thing — and why — propels her imagination. Then one day Hazel wakes up in a hospital and is told she was in a car crash. Her father has been killed and her brother seems different somehow. An FBI agent shows up asking questions about Jack, and she soon she realizes that a man has been found dead with a priceless book once owned by Benedict Arnold implanted in his chest. Jack Nash was reportedly with the victim just before he was killed. Hazel begins to doubt her childhood and even her brother’s motivations for her to stay out of the investigation. Her injuries have fogged her brain a bit, so is she actually remembering her life correctly? Or is there something more sinister happening? When the novel focuses on the mystery involving Benedict Arnold, “The House of Secrets” is classic Meltzer. What doesn’t work are the characters. Hazel, her brother and even Jack aren’t remotely likable, and readers will have difficulty sympathizing with them. The only fun character is someone who makes a cameo from one of Meltzer’s earlier novels. Off-putting ones have replaced the standard quirky and compelling characters.